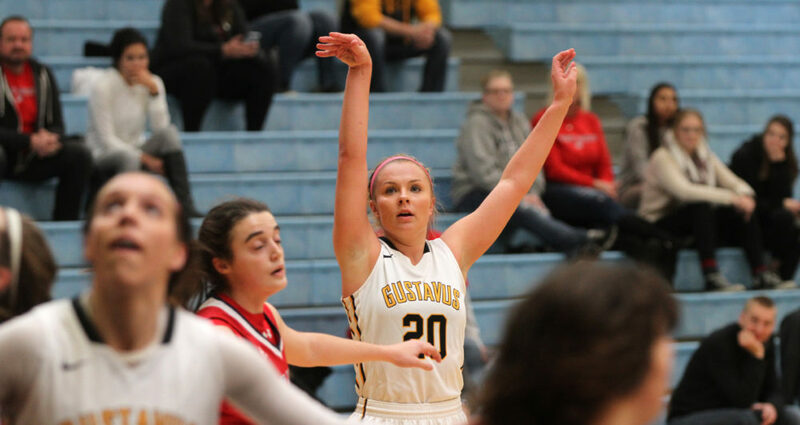 SAINT PETER, Minn. – Justine Lee (Sr., Dawson, Minn.) posted a career-high 26 points on 9-of-12 shooting to lead the Gustavus women’s basketball team to a 65-56 win over Saint Mary’s Saturday at Gus Young Court, improving to 5-4 overall and 2-1 in the MIAC. The Gusties forced 21 turnovers throughout the game, 14 via the steal. Gustavus finished the game at 41 percent shooting from the field and outscored the Cardinals 38-22 in the paint. The Gusties led wire to wire, jumping out to a quick 16-3 lead in the first 5:42 of the game. The Cardinals went on a 13-5 run to close out the first quarter and into the start of the second, but the Gusties outscored the visitors 7-2 in the final 2:42 of the half to carry a 35-26 advantage into the locker room. Saint Mary’s continued to fight in the third quarter and brought the score to three points at 39-36 midway through the frame, but once again the Gusties answered with an 11-1 run to close out the quarter and kept the Cardinals at bay in the final 10 minutes to secure the victory. Behind Lee, Paige Richert (So., Comfrey, Minn.) tallied 16 points. Kendall Thompson (Sr., Eden Prairie, Minn.) and Maddie Wagner (So., New Richland, Minn.) led the Gusties on the boards with five rebounds apiece. Gustavus continues play at Gus Young Court at 7 p.m. next Wednesday against St. Olaf.